Step 2: You can put it on the wall,on the table or on the window (strongly recommended). Place it horizontally or vertically. Step 3: In the TV's or STB's setup menu,set the tuner mode to "Antenna" or "Air". For more detailed instructions,please refer to your TV manual. Step 4: In the TV's or STB's setup menu,set TV to "scan" for channels. This can sometimes be listed as auto-program,auto-scan,channel search or channel scan. Consult the TV manual for detailed instructions. Step 5: If reception is sporadic,try moving the antenna to another location and rescanning the TV until optimal position is found. 1-Year Limited Warranty & 60-Day Money-Back Guarantee by Mibote only! 2. For optimal use, please monthly rescan TV channels. 3. To get strongest signal reception, please place the antenna on the window without obstacles such as big trees, buildings or hills outdoors. 【Enjoy Amounts HDTV Channels for Free】Never pay the cable or satellite fee for television again!Get local channels including ABC,CBS,FOX,NBC,PBS absolutely for free! Watch local news,weather forecast,sports programs,kids shows and sitcoms that satellite and cable do not offer without any cost. 【50 Mile Long Range Access】50 miles range to access from broadcast tower, it delivers 1080p full HD to any crystal clear digital-TV shows. Enjoy more HDTV shows than TV box freely. 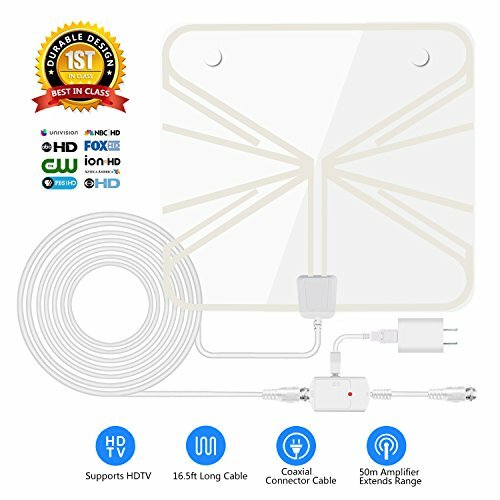 【Light Weight&Slim Indoor Antenna】Flexible and easy to install,16.5 feet cable antenna can be placed on anywhere including flat or curved area, wall or window glass(strongly recommended),or better position where owns better reception of your house, will be a good decoration for your house. 【Easy Operation】Fast and easy set up with 3 steps - Unwrap, Plug it in and Scan channels.Channel reception depends on the homes distance from a broadcast tower,the terrain,the surroundings,and what's being broadcast in your area. 【Warranty】We stand behind our products 100% with 365 days warranty and life-time technical supports,Please make sure that your TV is Digital TV and use it within 50 miles range.Will works well.